US Army Pfc. 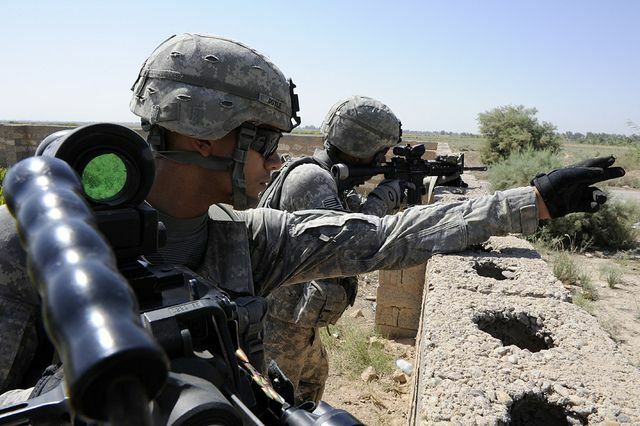 Wayne Doyle, left, of 3rd Platoon, Alpha Company, 2nd Battalion, 23rd Infantry Regiment, 4th Stryker Brigade Combat Team, 2nd Infantry Division provides, security while his platoon attends a local council meeting outside Forward Operating Base Taji, Iraq, on July 3, 2010. Photo via the US Army by Spc. Joshua E. Powell.